“You’ve been tagged!” (english version) – El blog de Andrés M.
mayo 29, 2007 julio 21, 2007 Andrés M.
(The percentaje is really greater than that, but for statistical reasons let’s leave it as is 😉 ). By the way, the header image has its meaning 😛 I want to put something related to the post, but after an “extensive” research in “St Google” I decided to make my own image (awww I’m inspired!). 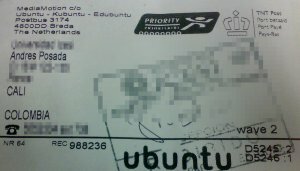 Anyways, that’s me “tagged” by Maud, whose tag appears represented as a Ubuntu sticker. A copy of the installation CD of that OS can be requested over the Internet and are sent by MediaMotion, a company of Netherlands (here is a picture of the CD envelop). Maud is from Netherlands, so that’s how everything fits here 😀 (The truth is that the Ubuntu sticker was the only thing that I’ve in hand :P). Really Andrés… jajajaja. What a GREAT addcitions. I love them. You cyberrobot! No I understand what made you feel so, eehmmmm unhuman… hahaha. (Kidding, kidding)And laziness… wow, that’s very similair to one of my character parts… espeically when it’s about studying for exams when I am totally NOT interested. I can be so LAZY. Haha.